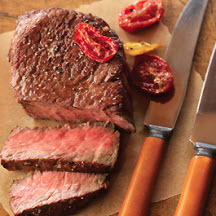 Skillet-cooked, beef steaks are served with oven-roasted grape or cherry tomatoes seasoned with thyme and garlic. Combine tomatoes, oil, thyme, garlic and salt in medium bowl; toss to coat well. Arrange tomatoes, cut sides up, on metal baking sheet lined with aluminum foil. Roast in 400°F (205°C) oven 30 to 35 minutes or until skins are wrinkled and begin to brown. Nutritional Information Per Serving (1/4 of recipe): Calories: 205; Total Fat: 10g; Saturated Fat: 3g; Cholesterol: 70mg; Total Carbs: 4g; Fiber: 1g; Protein: 25g; Sodium: 270mg.